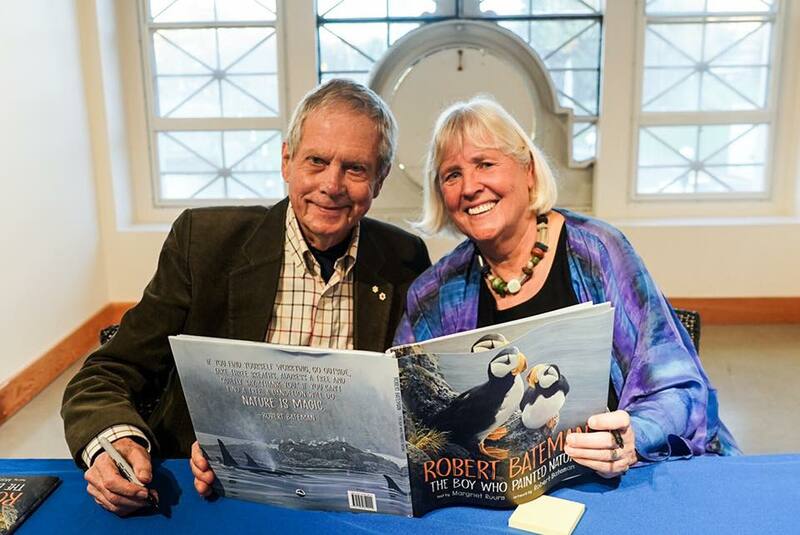 Painter Robert Bateman and children's book author Margriet Ruurs. Their book called Robert Bateman - The Boy Who Painted Nature, is a finalist for the BC Book Prizes. Authors of island provenance are abundant on the BC Book Prizes shortlist this year, with both newcomers to the field and veteran authors among the finalists. Those being considered with Salt Spring connections are Aidan Cassie, Kathy Page, Robert Bateman and Margriet Ruurs, and Harley Rustad. Cassie is in the running for the Christie Harris Illustrated Children’s Literature Prize for her picture book Sterling, Best Dog Ever. It is the first published book for the author/artist, who both illustrated and wrote the story. In the same category are a pair of well-known Salt Spring names, with Ruurs’ story Robert Bateman: The Boy Who Painted Nature illustrated by the famous island artist in question. Ruurs has written 35 children’s books and received multiple awards for many of them. Cassie had a foretaste of her success, and was equally shocked and excited, when the Toronto Public Library put Sterling on its top 10 list for “First and Best” books in December. She said being recognized here in her own province feels even more fantastic. “I’m so fortunate to have such a great group of author pals on Salt Spring; crit partners who helped make Sterling the book it is. There can’t be a better place to be a writer than in the Gulf Islands,” Cassie said. In other BC Book Prizes categories, Salt Spring’s Kathy Page is up for the Ethel Wilson Fiction Prize for her novel Dear Evelyn. The story of a 70-year marriage that begins with World War II and sours over time won the Rogers Trust Fiction Prize last November. Her two previous books were both nominated for the Scotiabank Giller Prize. Roderick Haig-Brown Regional Prize finalist Rustad was born and raised on Salt Spring and now lives in Toronto, where he is an editor at The Walrus magazine. He made the shortlist with his nonfiction book Big Lonely Doug: The Story of One of Canada’s Last Great Trees. The investigation of logging companies and eco-champions fighting over Vancouver Island’s old-growth forests started out as a long-form article in The Walrus that earned a National Magazine Award. The book was also a finalist at the 2018 Banff Mountain Book Competition.